By Jenny Hayward-Jones, Director of the Lowy Institute’s Melanesia Program, and Alastair Davis, an intern in the Melanesia Program. The depth of the fissures in the Fijian parliament became clear in early January when the leader of the NFP, Dr Biman Prasad, openly considered withdrawing his MPs from parliament in protest. Prasad had signalled the opposition parties’ frustration at the rejection of bipartisanship by Prime Minister Voreqe Bainimarama’s Fiji First majority and the lack of resources afforded to the opposition parties. Prasad’s frustrations prompted the publication of a damning op-ed in the Fiji Times that argued that Fiji’s democracy had become a facade. Prasad has been a vocal and pro-active opposition MP who has worked hard to contribute to the effectiveness of parliament. He is currently Chairman of the Public Accounts Committee, a key oversight committee that scrutinises government accounts. His chairmanship was one of the most effective opposition contributions to governance, though due to changes to standing orders passed while NFP members were excluded from parliament, Prasad looks likely to be replaced as Committee Chairman by a Fiji First member. Two days after the publication of Prasad’s op-ed, Supervisor of Elections Mohammed Saneem suspended the NFP for 30 days with immediate effect. The suspension notice cited non-compliance with the obligation under thePolitical Parties Decree to have party books audited by an accountant certified by the Fiji Institute of Accountants (FIA). The NFP confirmed that the company that audited their accounts — APNR — was certified in Australia but did not hold a Certificate of Public Practice in Fiji. Section 19 of the Political Parties Decree gives the registrar the right to suspend the registration of a political party to ‘enable’ said party to remedy the breach specified in the notice of suspension. The section also provides a process for the registrar to inform the party in writing of the particulars of the breach and allow the party 60 days to remedy it. The suspension of the NFP in response to a minor administrative oversight that could have been remedied quickly and easily seems unnecessarily heavy-handed and hardly conducive to building a well-functioning parliament. Solicitor General Sharvada Sharma works directly under the Attorney General, Bainimarama’s close ally Aiyaz Sayed-Khaiyum, who has also defended the suspension. As prominent lawyer Richard Naidu has pointed out, the lack of independent counsel for the legislature clearly undermines the separation of powers in Fiji. The Decree itself predates the return to democracy in Fiji, having been introduced in 2013 during the period of military dictatorship. 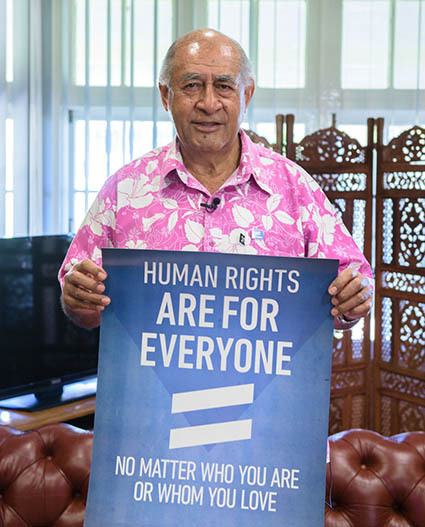 Along with the Media Decree, key pieces of legislation regulating the practice of politics in Fiji were introduced unilaterally by Bainimarama’s regime. Democracy can only flourish in Fiji when the supporting laws and institutions are strong and independent. Bainimarama himself heads the Constitutional Offices Commission, a six member group created to advise the president on public service and military office holders. SODELPA leader Ro Teimumu Kepa and Naidu were appointed to the commission in mid-2015, but Naidu resignedin November and Kepa has stopped attending meetings due to concerns over process. The three month extensionof General Sitiveni Qiliho’s appointment as acting police commissioner on 10 February reaffirmed Prime Minister Bainimarama’s reluctance to cede control over civilian institutions and preference for military officials to hold critical civil service leadership positions. Social media use has reinvigorated Fiji’s long suppressed public debate, and media outlets have enjoyed slightly more freedom to publish criticism and comment. Free speech and the capacity of citizens to hold their government to account are as important as ever for Fiji. Another Farce in Fiji’s Parliament? Only 20 sitting days have been allowed to Parliament this year. One has already been lost to a power blackout. So why did the Government waste so much time on Tuesday voting to suspend standing orders then debating and then voting through a motion to “endorse” the Speaker’s suspension of NFP’s Members of Parliament? Parliament cannot vote to suspend MPs unless the Speaker has named them for disorderly conduct (Standing Order 76). NFP’s MPs could not be guilty of that — they are not even there. So the Government motion is meaningless. But it may illustrate the poor understanding of certain of our current leaders of the role and function of Parliament in a democracy. Perhaps the Government’s “endorsement” motion is an attempt to put beyond judicial scrutiny the Speaker’s decision (apparently on the advice of the Solicitor-General) to suspend NFP’s parliamentarians. Time will tell whether that is correct. But a decision by a public officer, such as the Speaker, is still a decision and the law (whatever the law is) applies to that decision. A meaningless “endorsement” does not change the law in relation to that decision. More curious is Mr Sayed-Khaiyum’s justification of the Speaker’s decision to suspend the NFP parliamentarians in the first place. He appears to think that “any duly elected Member of Parliament must be a representative of a registered political party” (which is not correct — independent MPs may be elected). “Logically and consequently”, he says, “the suspension of registration of a political party must have the effect of suspending that party and its members from Parliament”. But that is not what the Political Parties Decree says. Section 27(6) says clearly that if a party is suspended for an offence against the decree, its MPs continue to hold their parliamentary seats. So why would it “logically and consequently” be different for a party such as NFP, suspended merely because it is accused of not having its audit signed off properly? But let us assume (perhaps in the face of the obvious) that Mr Sayed-Khaiyum is right. That would mean that, if his FijiFirst Party is suspended, for some (real or imagined) breach of the Political Parties Decree, “logically and consequently” Government would come to a halt. In a democracy, the Government derives its authority from Parliament. Under Mr Sayed-Khaiyum’s Constitution, a minister can only be a minister if he is a Member of Parliament. So if a minister does not qualify to sit in Parliament (on account of his or her party being suspended), he or she cannot function as a minister. Is this “logically and consequently” how the country is supposed to be governed? This is not “true” democracy. This is “Alice in Wonderland” democracy. Government is a business to be carried on with respect for everybody. It is not something you make up as you go along just so you can win today’s argument. We think Richard is correct, so be on the lookout for yet another decree to make him incorrect. Today Sunday 7th February 2016 Pensioner David Burness passed away after a short illness. David Burness, his and other senior citizens treatment under Decree 51 orchestrated by the office of the Attorney General on the basis on non factual information provided by the FNPF management was the reason this blog site was launched in 2011. Some will say the government actions accelerated Davids death, be that as it may, the battle will continue as David would wish. RIP David Burness, you will be missed by all who knew you. Unlike some of Fiji’s media we have always attempted to deal in facts, and the fact is, David has gone, but the class action has not, and will not. This action lives on. In the annals of injustice and arbitrary governance it will stand as witness to the arrogance and inhumanity of corrupt governance. It behoves any person of integrity to see it through to a just conclusion. For David Burness’ legacy and the sake of all those whom he had the courage with his Counsel to represent. History will vindicate David Burness and the Pensioners of Fiji. May his widow Talei and family be comforted at this time of great sorrow.